This entry was posted in Ghost Rider, Marvel Essentials and tagged Frank Robbins, Gary Friedrich, George Tuska, Ghost Rider, Jim Mooney, John Byrne, Marv Wolfman, Mike Ploog, Roy Thomas, Tom Sutton, Tony Isabella. Bookmark the permalink. 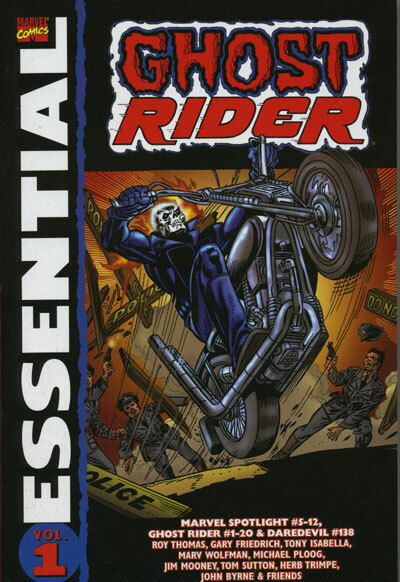 Pingback: Throwback Thursday – Essential Ghost Rider Vol. 1 – WORST. COMIC. PODCAST. EVER! Pingback: Throwback Thursday – Essential Doctor Strange Vol. 1 – WORST. COMIC. PODCAST. EVER! Pingback: Throwback Thursday – Essential Doctor Strange Vol. 2 – WORST. COMIC. PODCAST. EVER!